So just who is Jenny Kee, you ask? 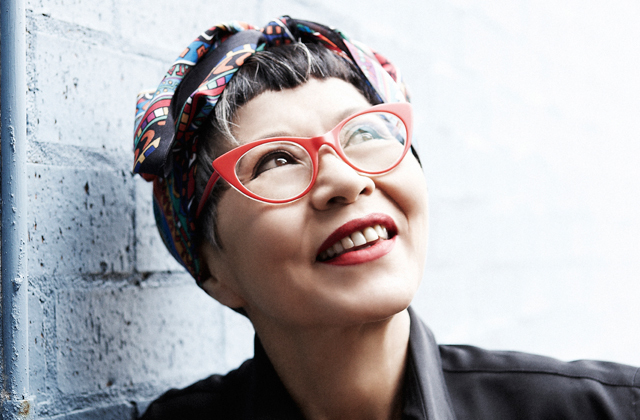 With her trademark short bob and red glassses, she one of the most highly recognised and accomplished Australian fashion icons. 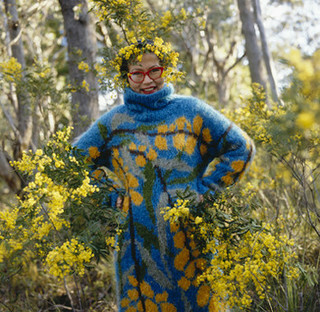 Jenny Kee has been creating her fabulous designs since the late 60's, early 70's. Her passion for the Australian environment is reflected in her artwork and designs. 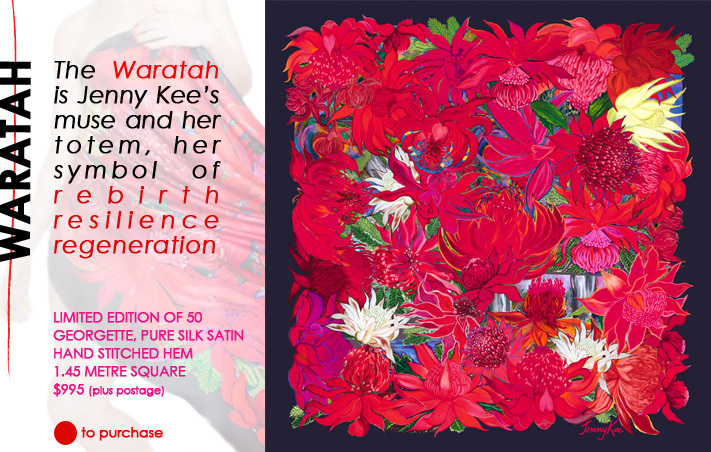 I thought it was of vital importance to complete a special feature about Jenny Kee, since she is such an inpsiration, both as an artist and fashion designer, here in Australia and internationally. 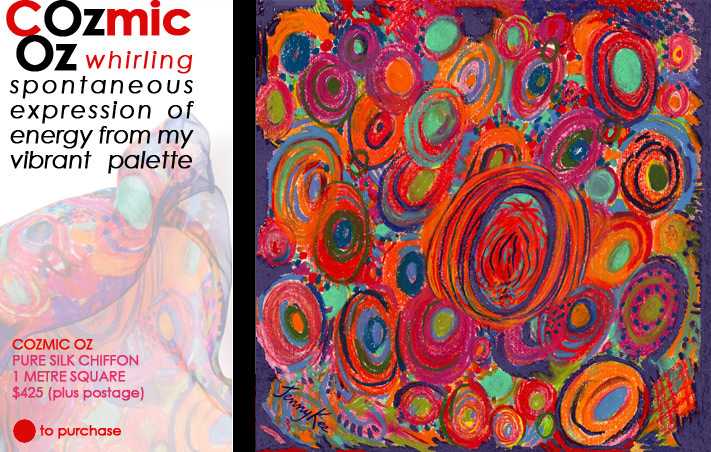 I am passionate about supporting and showcasing the vast array of talent in this country. Jenny Kee rates high on this list and has done so for a considerable number of years. I love Jenny Kee's silk scarves! They are just so colourful. 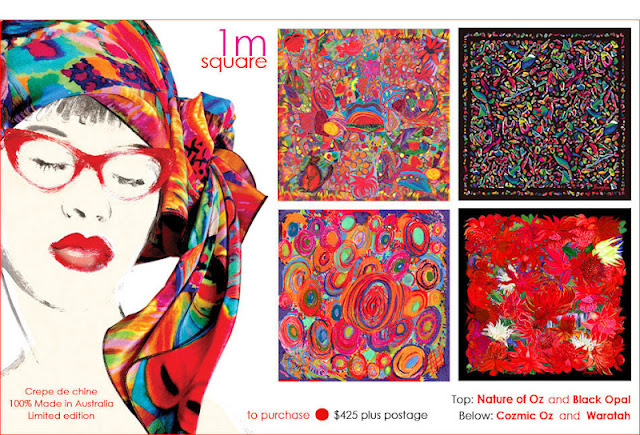 Her scarves come in different designs and sizes as well. 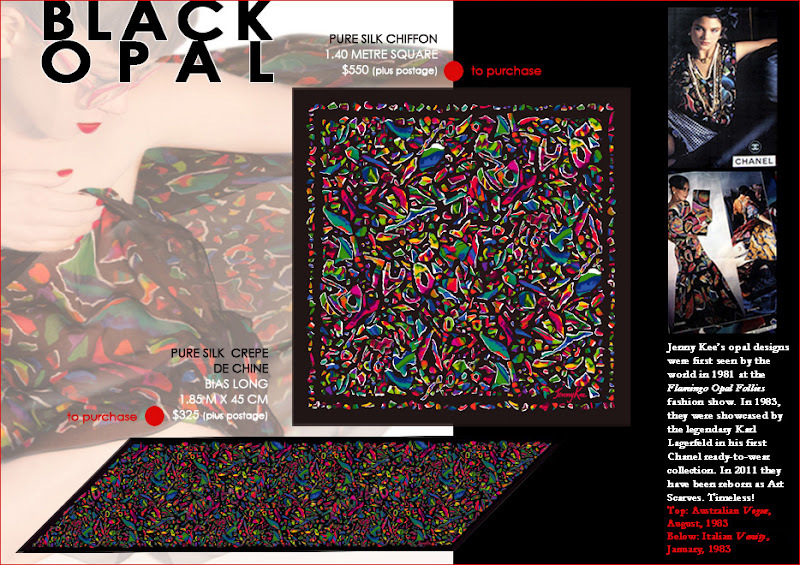 There's a scarf to suit any body, myself included. 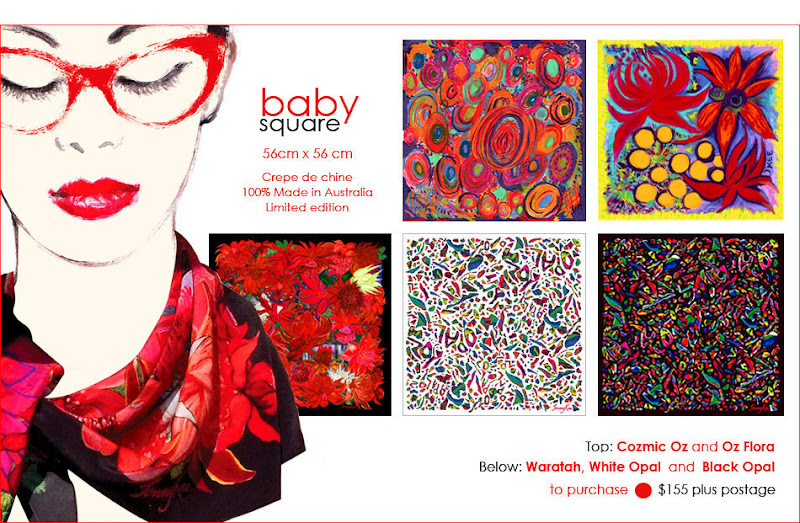 My favourites are the baby bias and baby square, of course! Jenny Kee's fabulous silk scarves are available for purchase online on her website, and are stocked at boutiques, such as Alice Euphemia, and select museums and art galleries. 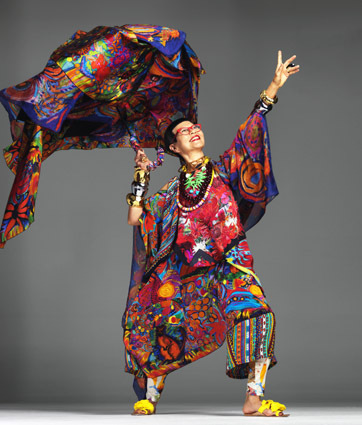 I'm interested to learn about any international fashion icons you know of? Please leave a comment below! 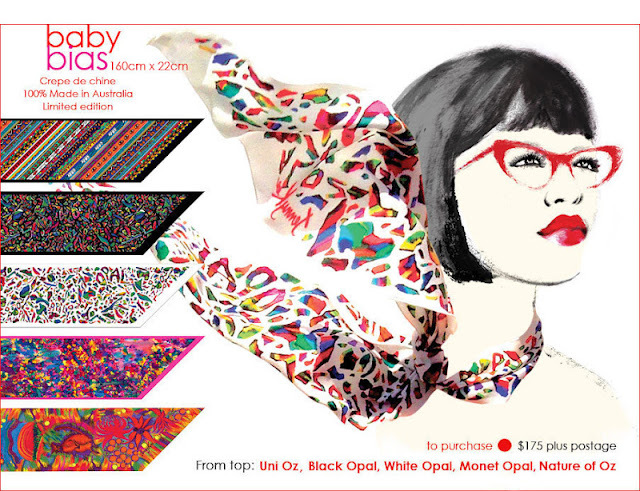 The white opal baby bias scarf looks great. I love the monet opal baby bias scarf! Those scarves are gorgeous, I love how colorful they are. How have I never heard of her before?? I love these scarves, such beautiful colours! I know, they're just stunning! These scarves are so NOW! Have never heard about her! But she is amazing!!! She certainly is, that's for sure! Thanks for your comment. Her designs are so beautiful. I'd never heard of her until now, so I'm really glad you featured her!